Salisbury University was founded in 1924 and offers 43 majors and 65 minors including four schools: Fulton, Henson, Perdu, and Seidel. Each school has different subjects to study for each major for example; Perdue is the school of Business, Henson is the school of Science and Technology, Fulton is the school of Liberal Arts and Seidel is the School of Education. Perdue is the School of Business, which was named after Franklin Perdue the Founder of Perdue Chicken. The building was constructed to mimic the type of architecture in the business world. On the inside, there are huge screens with live stock updates going by as fast as the ones on Wall Street in New York City! A large TV greets you once you walk in with news from many different news channels such as CNN and Bloomberg. In the lobby there's also have Perdue's head on display. In the same building, there's an office called the Innovation and Entrepreneurship office. The School of Business hosts events like Gull Cage, which is a parody of Shark tank where the students go in with ideas and get people to support their ideas and give them that loan they need to jump-start their idea or product. Mark Cuban even came to the university and sat through some of the business ideas and approved of the program. The class sizes at Salisbury University have a ration of 17:1 and last up to two and a half hours. On the university’s websites allow students to filter through options to determine which classes are better for you during specific times and days of the week. As we walked through campus, you can sense the joy the students have while attending the university. There are so many opportunities and activities for students to enjoy such as the spin bikes that students can rent for only fifty cents a ride, S.O.A.P. (Student Organized Activity Program), volleyball courts all around, volunteering opportunities and so much more. In the heart of the campus, you will find "the Quad" which is surrounded by residence halls for sophomores and the freshmen. "The Quad" is also where the university holds most of their parties and concerts. We continued walking past "the Quad," went into the gym which holds an Olympic sized Swimming pool, a weight room and a full basketball court with bleachers that can hold up to 9500 students. Salisbury has over 21 Division 3 teams, but they are most popular for there Lacrosse team who has won 2 years in a row. 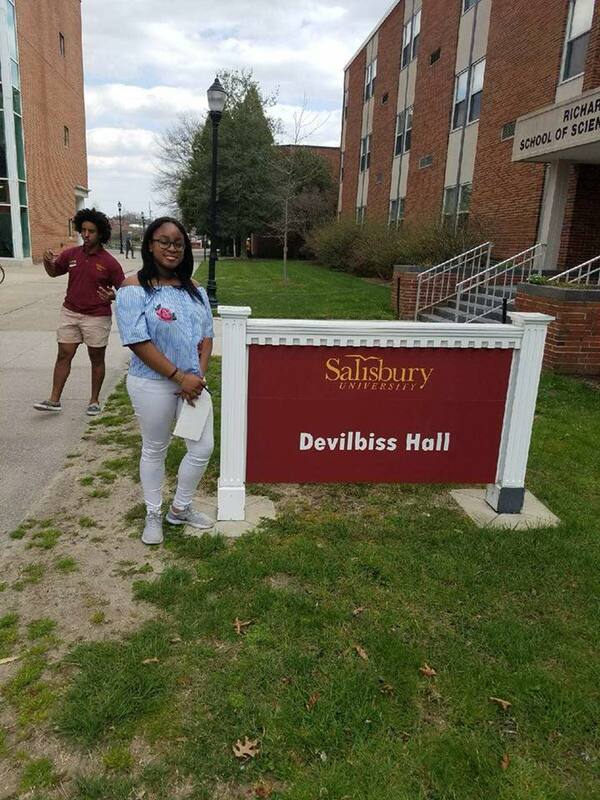 There are so many things to do in Salisbury, that's there's never a dull moment for the students because of the 120+ clubs, fraternities and sororities, and the pit in the library where you can hang out with your friends. Older PostAyanna McCoy and Jurnee Gilchrist report from the University of Maryland Eastern Shore on Carver's annual spring college tour!